If you’re new to my 52 zippers project, you can read the backstory here. 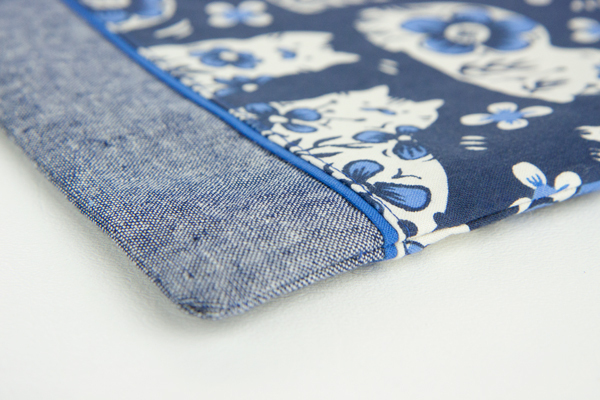 In my previous post there are instructions on how to make a basic zipper pouch. This bag I made to fit 8″ x 8″ zip-top bags or quart sized zip-top bags. 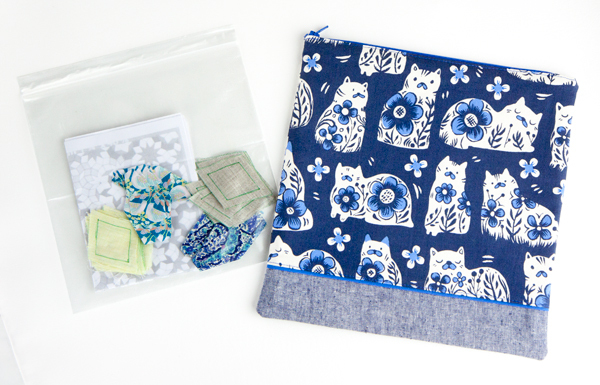 I use these bags to kit up small EPP and hand piecing projects. I am trying to kit up several projects for the summer over the next few months; this pouch will be a great place to stow them. I only had a fat quarter of the cat fabric, and when I cut the fat quarter into quarters, the bag was not quite long enough. 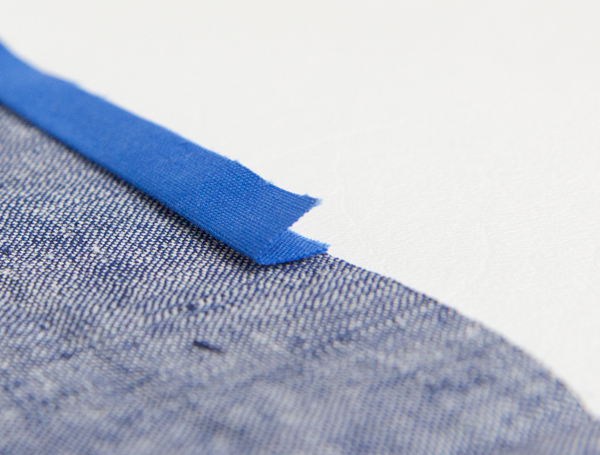 So I added a 2.5″ strip of Essex yarn-dyed linen in Denim to the bottom. I wanted to use this lovely royal blue zipper and thought that adding a little accent of the same royal blue (Kona Surf) to the body of the bag would look good. 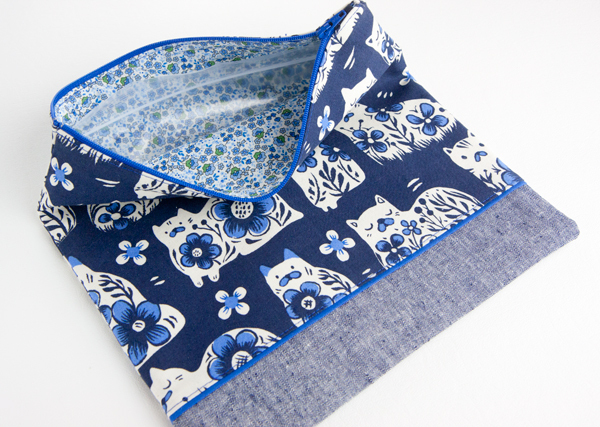 I lined the bag with a little blue calico print. I am testing a new zipper method so I only added a zipper tab to one end. I hope to be done prototyping soon and will post instructions when I have it down. To add a flange, I cut a 3/4″ strip of Kona Surf. I folded it in half and pressed it, and then glue basted it to the top edge of the Essex strip, lining up all the raw edges. I then lined up the cat fabric on top of that just as if I was piecing it normally, right sides together with the Essex and raw edges aligned. After stitching all the layers together with a 1/4″ seam I pressed the seam towards the cat fabric and then topstitched near the edge of the cat fabric. 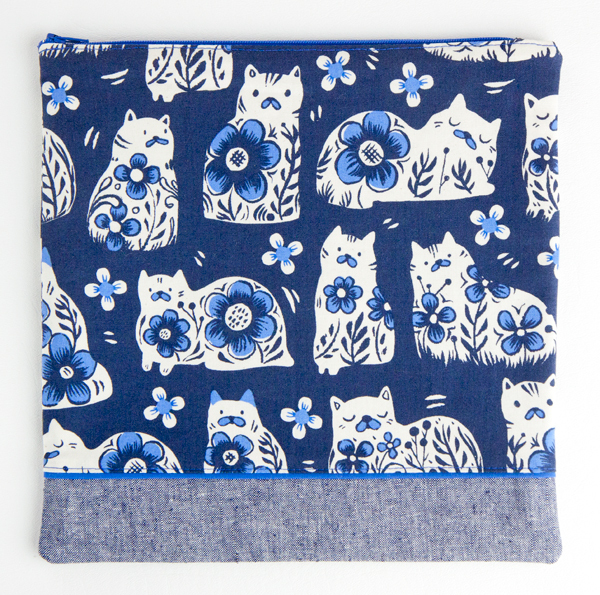 Outer pieces (2): Cats: 11″ w x 9″ h, Flange: 11″ w x 0.75″ h, Linen: 11″ w x 2.5″ h.
Very cute! I like your idea to line zipper bags with plastic sip top baggies. Thanks for the tutorial about the flange. this is a great pouch! I like the accent on the bottom, especially with the flange. way to make “not quite enough fabric” work so well! The flange and piping takes the bag up another notch – looks terrific!